The year 1907 marked the beginning of the first “golden age” of baseball postcards, with the issuance of seven major postcard issues featuring individual players from major league teams. 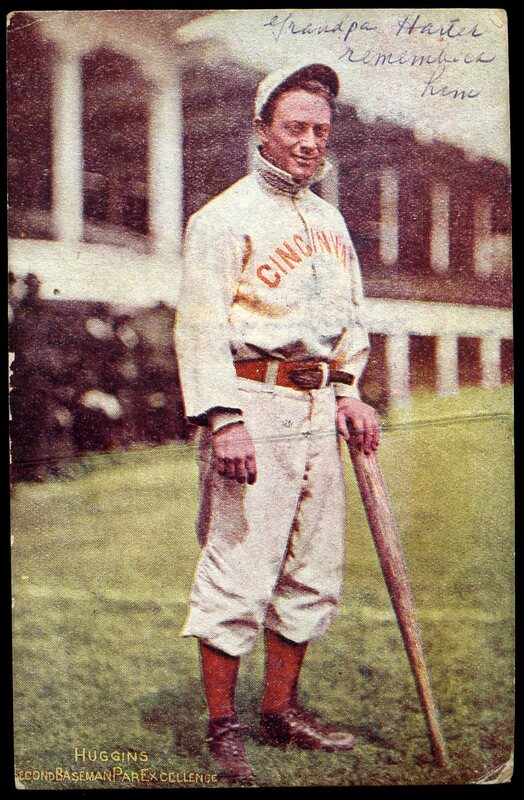 Most notably, the Cincinnati Reds became the beneficiaries of the first-ever color postcard set, which was marketed by the Morgan Stationery Co. In 1907, the Morgan Stationery Co. of Cincinnati issued the first-ever color postcard set of baseball players, showcasing the hometown Reds and their opponents (and one oddball card showcasing a member of the Boston Red Sox). 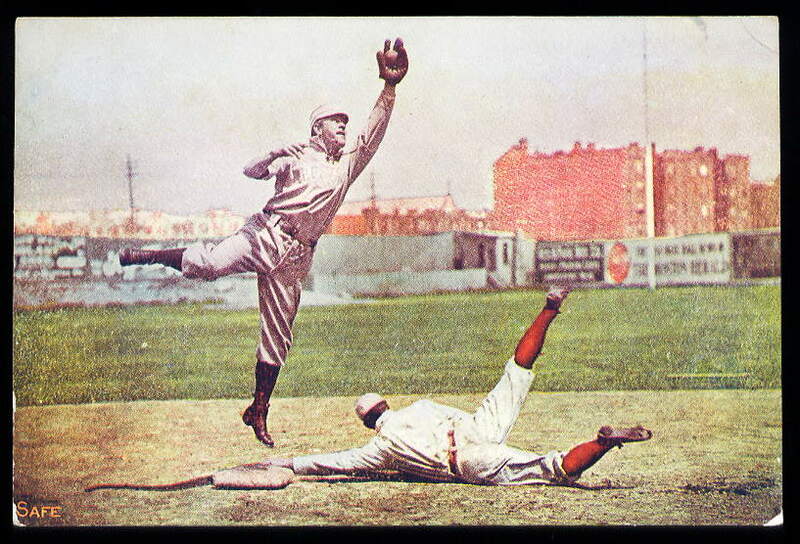 A 12 card set known colloquially as "Red Belt" postcards, the issue is marked by bright hand-tinted colors and red belts on all player uniforms. 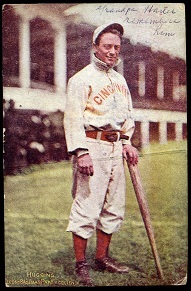 Only one player is identified by name, the Reds star second baseman, Miller Huggins, who led the team in batting the year prior. Other players include many of his teammates as well as players from the minor league Toldeo team which also called Ohio home. Many of these players are easily identified, as are the stadium backdrops for this beautiful set. 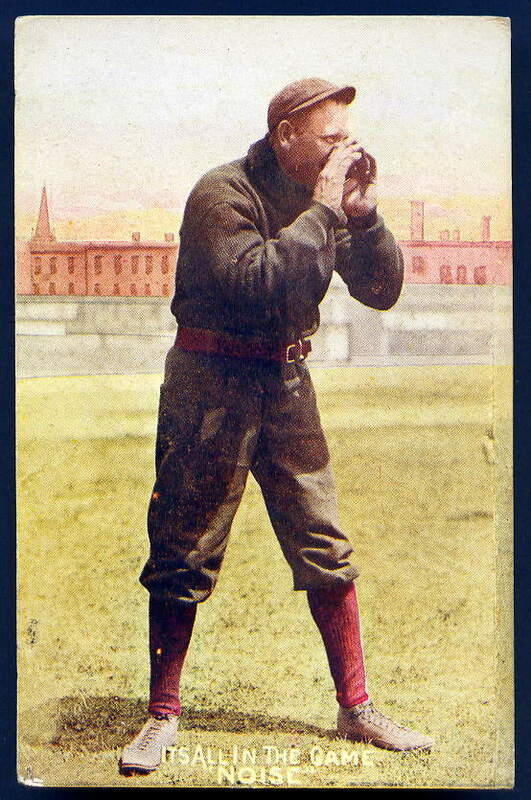 Entitled, "It's All In The Game / Noise," this card depicts a Reds player, manager or coach urging his team on, wearing what appears to be a road uniform. 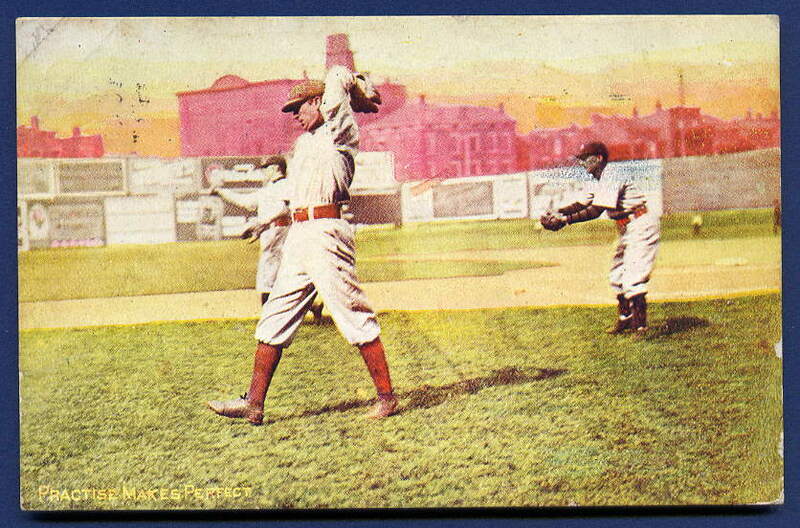 It is one of two cards featuring a painted or "fake" ballpark backdrop. 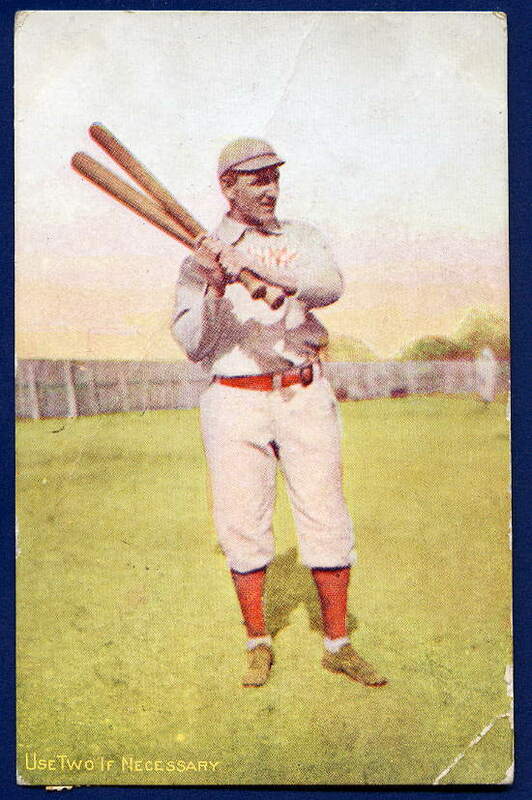 This card, "Huggins Second Baseman Par Excellence," is one of two variations of the Huggins postcard. This specimen (courtesy of Old Cardboard) also features a painted backdrop. 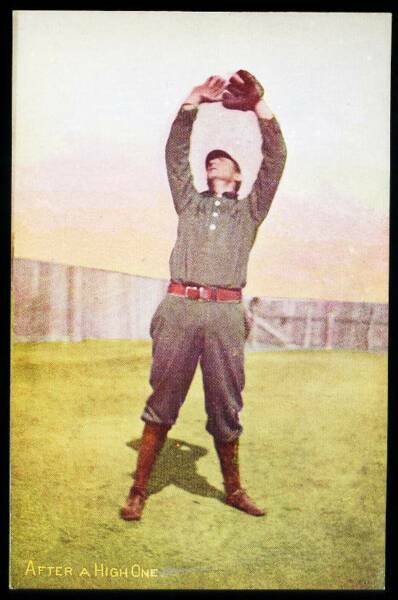 Captioned "Use Two If Necessary," this card shows a previously unidentified player who is definitely Hans Lobert. The ballpark has yet to be determined. Dubbed "Practise (sic) Makes Perfect," this card showcases a player who is not a member of the Reds, Pittsburgh PIrates pitcher Sam Leever. Leever was included because he was from Goshen, OH, according to one old memorabilia guide. The setting for this card has been identified in Tom Crabtree's Baseball Stadium Postcards as the Reds ballpark, the Palace Of The Fans, with the ads on the outfield wall clearly visible. Another in-action image, this card is aptly captioned, "Hit And Run." With bat still in-hand, the Reds' batsman is embarking toward first base, with the left field grandstand and outfield wall signs clearly visible in the background. The batter is unnamed and has not, to-date, been indentified by any catalogers. 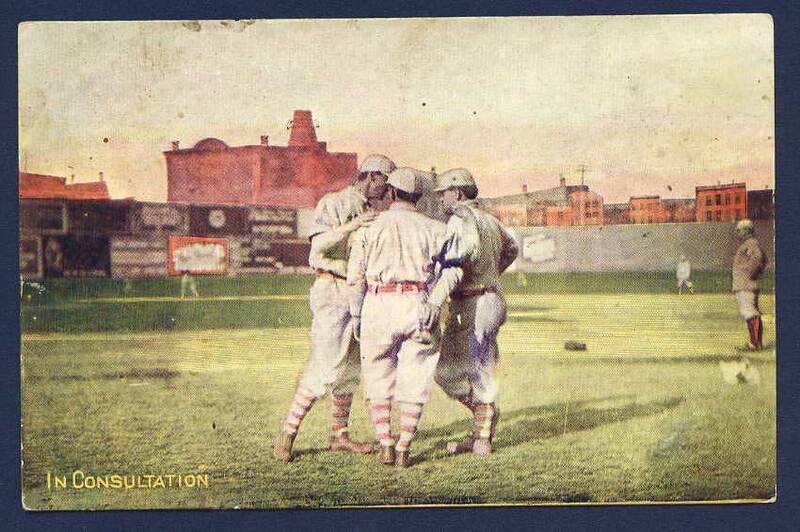 Another "Red Belt" postcard that clearly shows the Cincinnati ballpark's columns, erected in 1902. 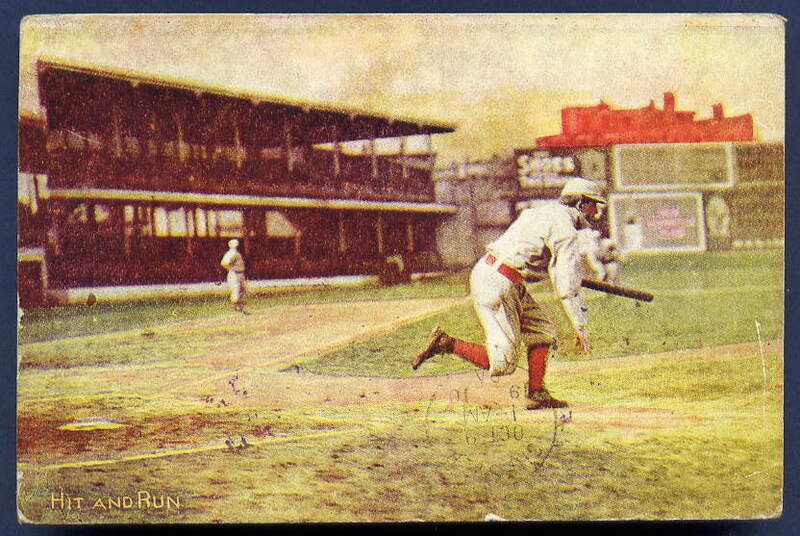 This card, entitled "A Home Run" captures an in-action shot with right centerfield in the background. The player rounding third has a clear "Toledo" emblazoned across his chest. This postcard, "In Consultation," also depicts Toledo players, as evidenced by their striped socks which were not standard Reds issue and can also be seen in the "A Home Run Card" above. 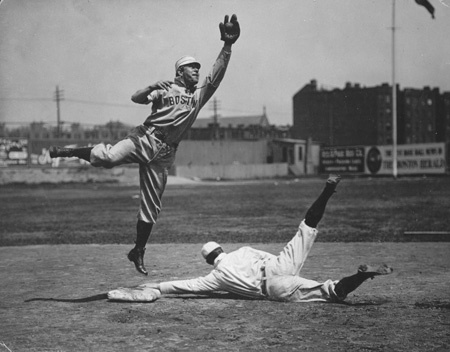 In addition to these postcards set in Cincinnati, another "Red Belt" postcard shows a play at second base at Boston's Huntington Avenue Grounds and is entitled "Safe" and shows a leaping player. 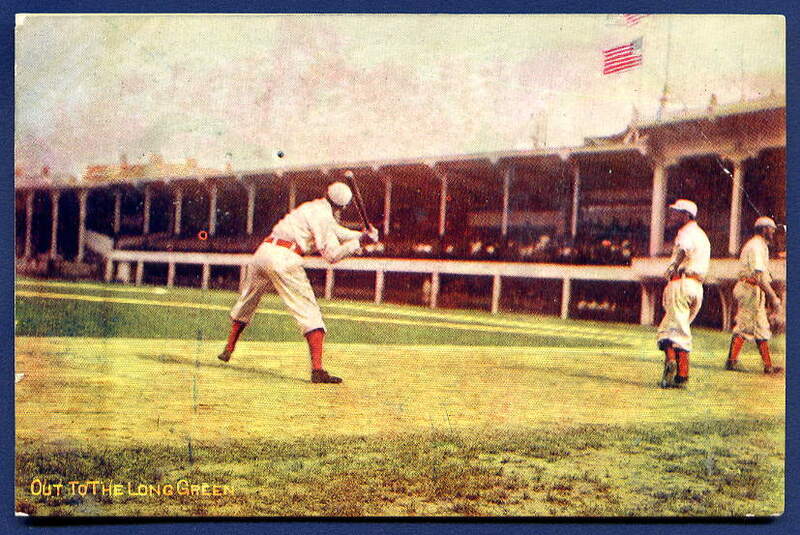 Showing a wider expanse of the ballpark’s grandstand, this postcard has the longest title of any in the series. 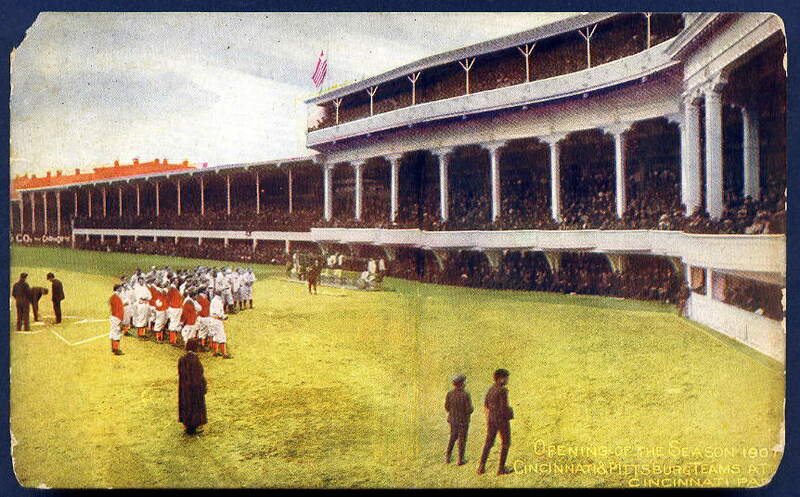 Featuring both the Reds and Pirates behind home plate, this card is dubbed: “Opening Of The Season 1907 / Cincinnati & Pittsburg Teams At Cincinnati Park.” Indeed, on April 11th, 1907, the two teams met for a one-game series, with the Reds emerging victorious, 4-3. This particular card seems to be the hardest-to-find in an already difficult to complete series, appearing very infrequently for sale as a single postcard. 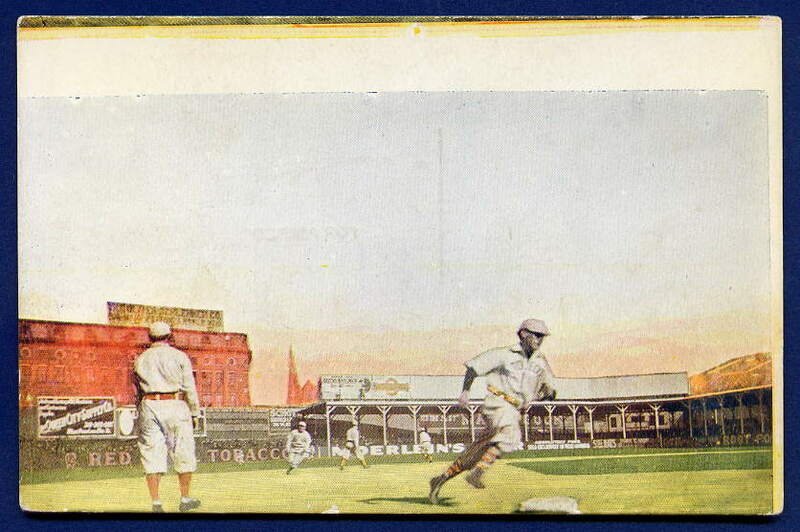 This card, "Out To The Long Green," captures the classic first base grandstand at the Palace Of The Fans, with the players as-yet unidentified. This card, "Use Two If Necessary," highlights an as-yet-unidentified player in a Reds road uniform posed waiting for a fly ball. Ballpark is similalrly unknown. Most puzzling in the Red Belt set is this card, entitled "Safe," which clearly captures an in-action pose of a Boston Red Sox player, leaping for a throw at second base. The word "Boston" appears across his chest and Boston's Huntington Avenue Grounds is evident in the background. Even more intersting than the Boston locale is the player, himself, who has been definitively identified as Hall of Fame Red Sox third baseman, Jimmy Collins, who played for the team from 1901 to 1907 (and with the Boston Beaneaters before that). And, strangely, the image shows Collins in dress footwear, not baseball spikes. Even more strange is the fact that Collins played third base, not second in his illustrious career, yet this shot is clearly posed at second base. The original black and white photograph from which this card was made (above right), was taken by renowned local photographer, Edmunds E. Bond, whose photo collection currently resides in the Boston Public Libarry. Curiously, this photo is from 1901 or 1905 depending on if you believe the identification in book "The Red Sox Century" or from the Boston Public Library. Why Morgan Stationery chose to use this image years later in an Ohio-themed postcard series is an unresolved mystery. This is the second variation of the Huggins card. The backdrop is the actual photo of the Palace of the Fans ballpark and the caption at lower left is formatted differently and is a different color.